University of Texas Rio Grande Valley's Ragni Steen Knudsen (1) slams the ball past Kansas City defenders in the WAC regular-season final at the UTRGV Fieldhouse on Saturday, Nov. 17, 2018, in Edinburg. 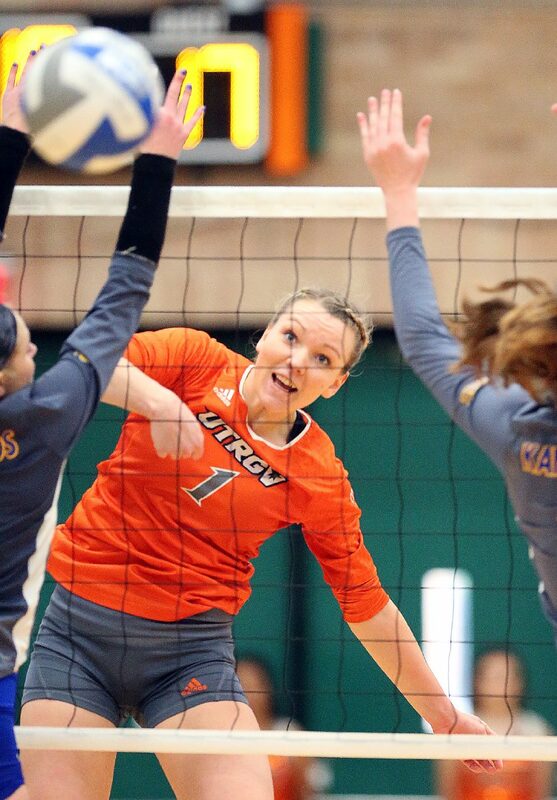 BAKERSFIELD, Calif. – The Western Athletic Conference announced on Wednesday that UTRGV senior outside hitter Ragni Steen Knudsen is the WAC Volleyball Player of the Year and a member of the All-WAC First Team, while senior middle blocker Alexandra Ecker and junior right side Barbara Silva are part of the All-WAC Second Team, as voted on by the WAC’s head coaches. A four-time WAC Offensive Player of the Week, Knudsen led the WAC in kills (4.27) and points (4.79) per set and ranked ninth in hitting percentage (.259) during WAC play. She also averaged 2.74 digs, 0.47 blocks and 0.27 aces per set and posted eight double-doubles during WAC play. Overall, Knudsen is averaging 3.94 kills, 2.67 digs, 0.37 blocks and 0.21 aces per set. She is the first player in program history to record three seasons of at least 400 kills with 402 this season, 421 last season and 471 in 2016. Knudsen ranks fourth in NCAA Division I program history and 49th in the NCAA among active players in kills with 1,294. She holds the record for kills per set at 3.70 and is tied for seventh in hitting percentage at .236. Ecker ranked sixth in the WAC during WAC play with a .306 hitting percentage and an average of 1.13 blocks per set. She also averaged 1.27 kills and 1.08 digs per set and earned a WAC Defensive Player of the Week award. Overall, Ecker is averaging 1.55 kills on .337 hitting, 0.93 digs and 1.00 blocks per set. She is the NCAA Division I program record-holder in total blocks with 418 and block assists with 379. Silva averaged 2.72 kills on .227 hitting, 1.33 digs and 0.60 blocks per set during WAC play. Overall, she is averaging 3.11 kills on .239 hitting, 1.74 digs and 0.61 blocks per set. UTRGV, on an eight-match winning streak and ranked a program-record 69th in the NCAA Ratings Percentage Index (RPI), enters the WAC Tournament as the No. 1 seed after winning the WAC Championship with a 13-3 conference record. UTRGV will face either No. 4 seed Utah Valley or No. 5 seed and host CSU Bakersfield at 6:30 p.m. Friday in the semifinals. The winner will play for the WAC championship and an automatic berth in the NCAA Tournament at 9 p.m. Saturday.